Welcome to the SnowSphere shop, here you'll find a range of products for skiers and snowboarders. SnowSphere is all about travelling and snow sports, so we have designed a line of SnowSphere tees and hoodies to reflect the diverse world of skiing, snowboarding and mountains. Each design takes national icons, local language and cultural symbols and combines them with a snow theme to produce a unique design, exclusively available from SnowSphere and nowhere else. All designs are available on both tees and hoodies, in men's and women's cuts, in a variety of colours and sizes. Tees from £15.90, hoodies from £27.90. Click here to buy a SnowSphere T-shirt or Hoodie now! Japan is a haven for snowboarding and skiing, with over 500 ski resorts, some of the deepest powder in the world, not to mention a crazy cultural adventure. 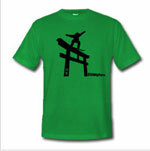 This design depicts a snowboarder sliding a 'Torii' - a wooden gateway that traditionally marks the entrance to a sacred place which are seen throughout the country. The Japanese Kanji characters read 'Nihon' - meaning Japan. Russia is a untapped winter sports resource, with massive mountains and huge snow falls. The 2014 Winter Olympics will be held in the Russian ski resort of Sochi, and it's likely that this will pave the way for more westerners to take a ski trip there. This design uses some Soviet styling to depict the giant Russian-made Mi-8 Hip helicopter that is famous for taking heli-skiers and snowboarders into the mountains of Russia. The faux-Cyrillic script on the chopper reads 'SnowSphere' and the Cyrillic on the mountains reads 'Russia'. We like bears - and we associate them with mountains. This stylish Russian Bear design uses a national symbol of Russia combined with faux-Cyrillic and Cyrillic script that reads 'SnowSphere Russia'. Perfect for all lovers of bears, Russia, or SnowSphere. We are working on new designs so keep checking back at the SnowSphere Shop for more!